Also, this article discusses James' thoughts on "consciousness" as "forum." "Good involves the notion of less good, necessitates comparison, and for a drop of water either to compare its present state with an absent state or to compare its total self with a drop of wine, would involve a process not commonly thought of as physical. Comparison requires a tertium quid, a locus―call it what you will―in which the two outward existences may meet on equal terms. This forum is what is known as a consciousness", he said. We can understand what he's implying here as follows. That is to say, Value or Truth appears with the birth of Consciousness simultaneously. The traditional interpretations of James' thoughts have indicated that his positions on philosophy were wavering. 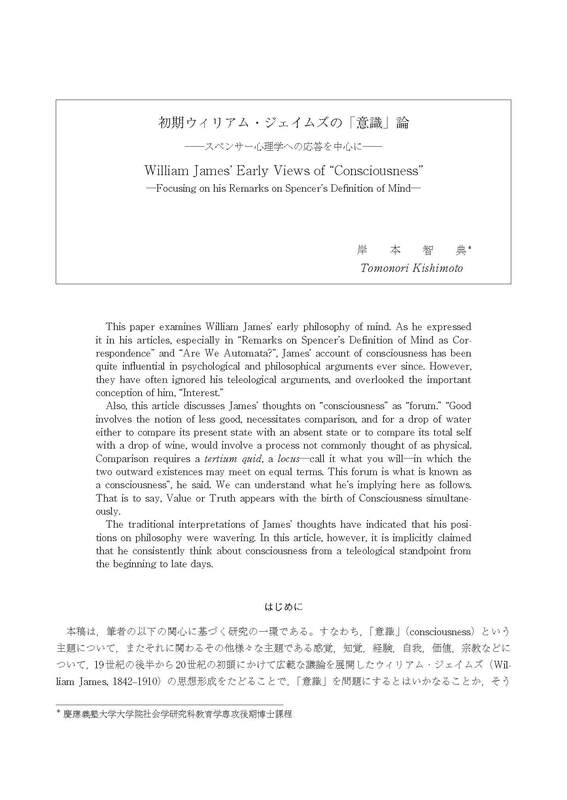 In this article, however, it is implicitly claimed that he consistently think about consciousness from a teleological standpoint from the beginning to late days.